Michael Slag holds in his hands a tumor – or rather a 3-D print of the actual tumor that is growing at the top of his right lung. Doctors are using the 3-D printed model to aid them in planning the complex surgery to remove Michael’s tumor. Mayo Clinic doctors diagnosed Michael with a rare form of lung cancer known as Pancoast tumor, a condition so rare that Mayo Clinic has only seen 60 cases in the past 20 years. 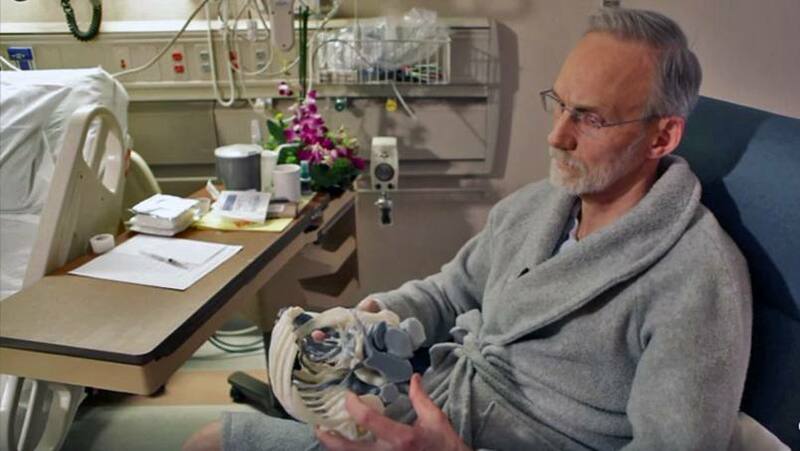 With the 3-D model of Michael’s lung and the tumor, his doctors were armed with all the information they needed to plan a course of action prior to his surgery. Dr. Blackmon says the 3-D model helped eliminate any surprises by showing the team exactly how Michael’s large tumor was wrapped around several critical nerves and blood vessels. The surgical team was able to remove the tumor with a minimally invasive surgery, and in just three days, Michael was able to go home. Explore the Department of Diagnostic Radiology. See more stories on the Mayo Clinic News Network.